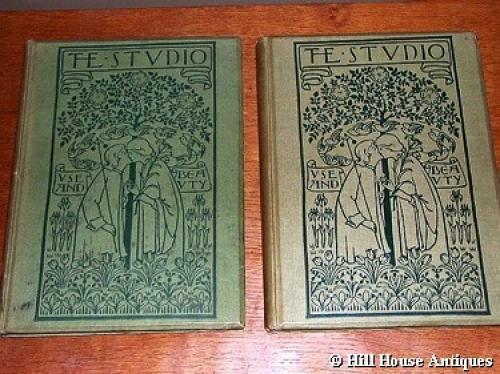 Rare editions of The Studio Volumes 1 and 2, 1893/1894 - the ones with the cover designed by CFA Voysey. Use is represented by a male figure holding the governor of a steam engine and who kisses Beauty, represented by a female figure holding a lily; both standing under a tree in a garden, their heads encircled by a flight of birds. In very good condition overall, and complete. Some minor internal foxing commensurate with age.